Still looking for a hat for the Halloween? The creature on top of the hat is not an alien or a monster but a tiger. 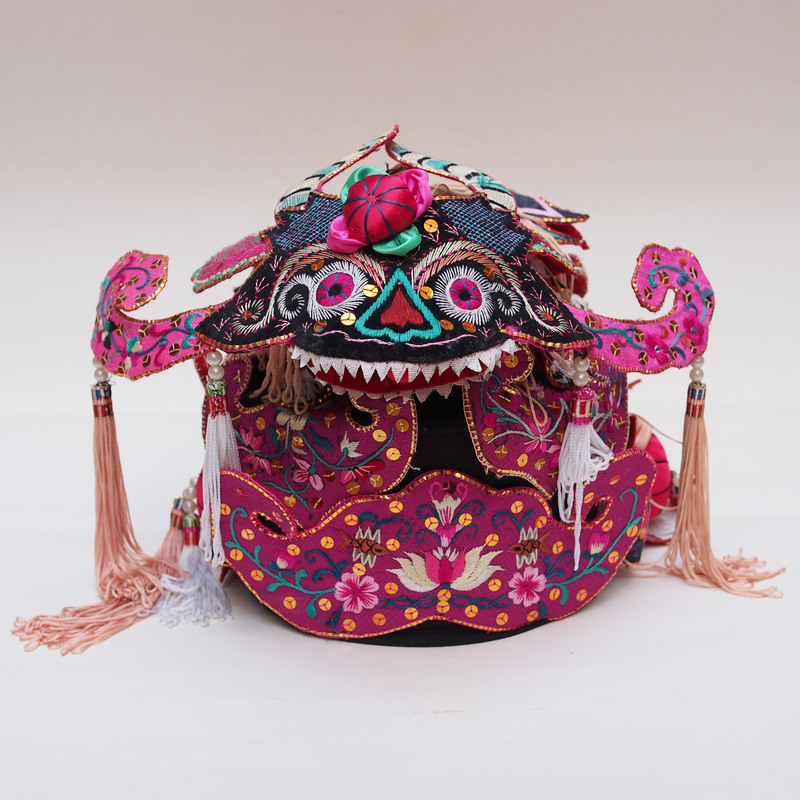 This powerful animal has been a subject for worship, its strength and fearless image offers a kind of protection and aspiration for the Chinese. 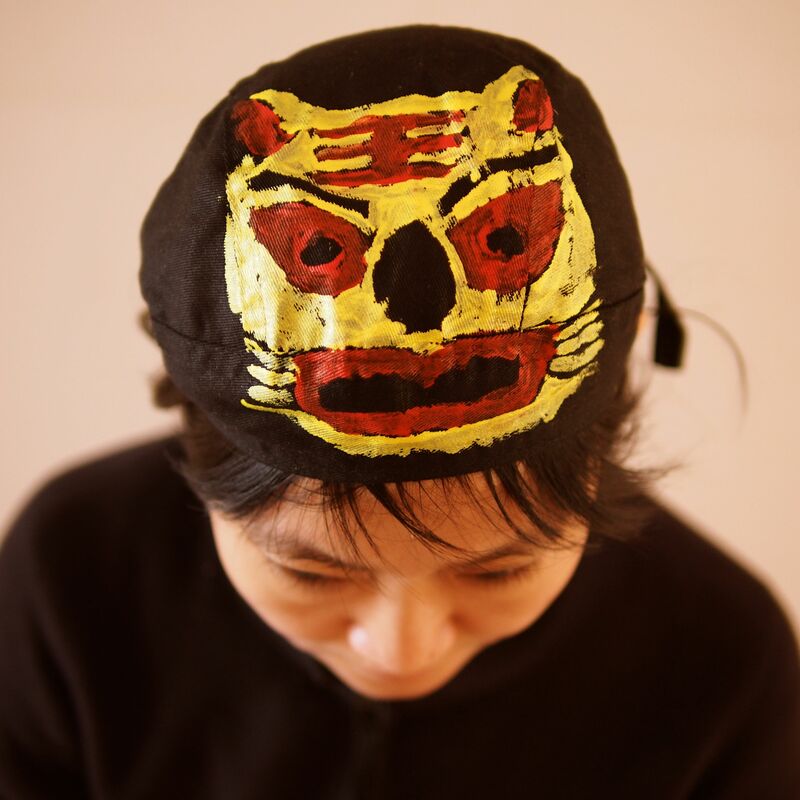 Along with other costume of the tiger theme, the tiger hat would be given to the child by the parents on Chinese New Year so the child can be protected for the rest of the year. Click here to see the other tiger costumes. 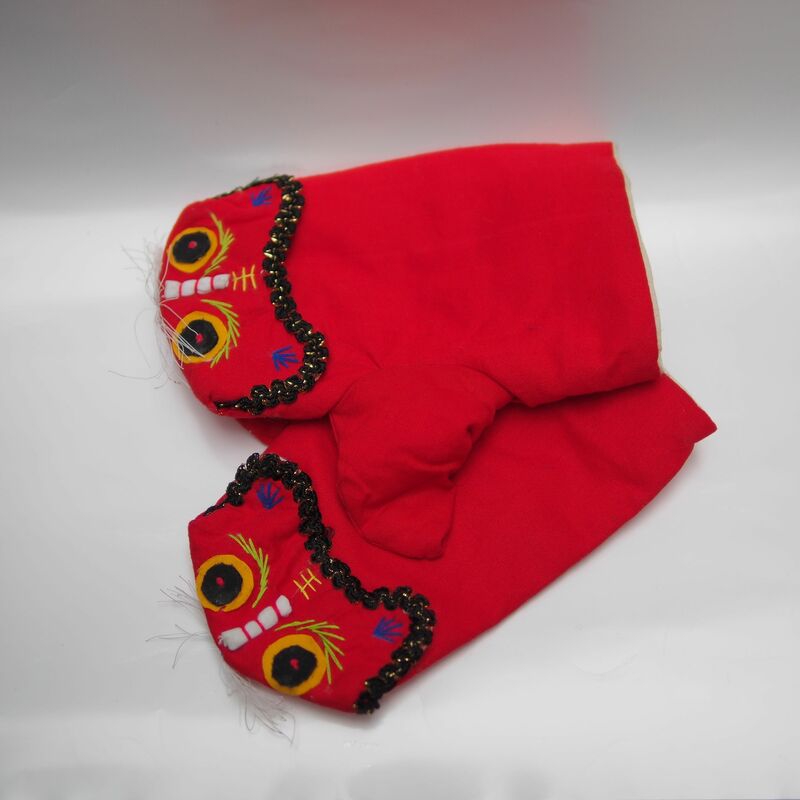 For the Chinese New Year, it is common for the parents to make tiger theme costume for their children. 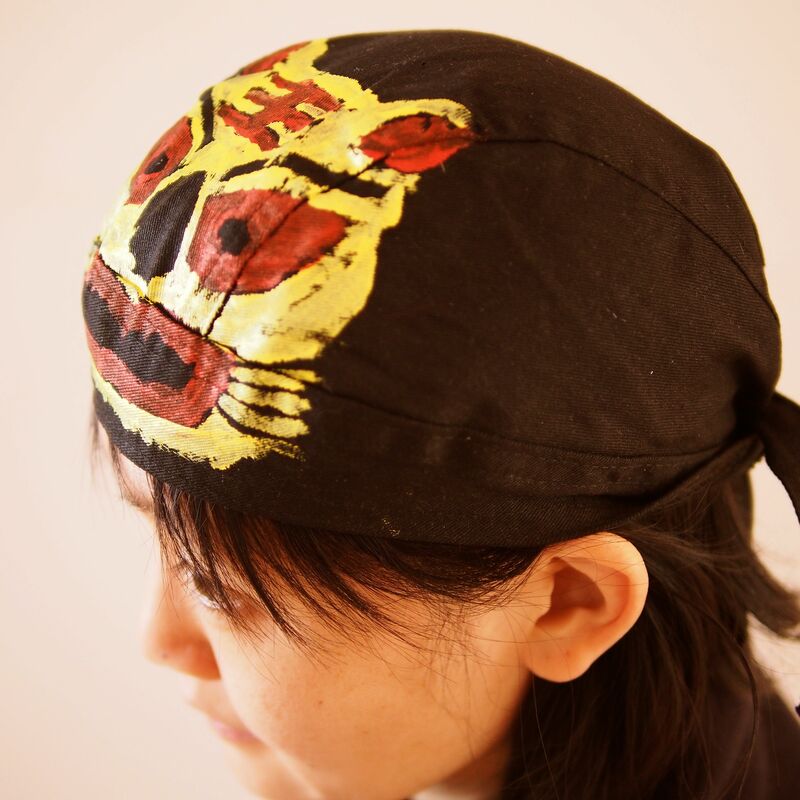 We have incorporated the tiger pattern with the biker’s head wrap which make it more fashionable for teenager and adults alike. Tiger is admired for its strength and bravery, it is believe that not only will the tiger protect the children but they will also grow up to be as strong as the tiger. See our our tiger items. Original tiger hats are also available. We will like to take this opportunity to wish you a happy Chinese New Year! 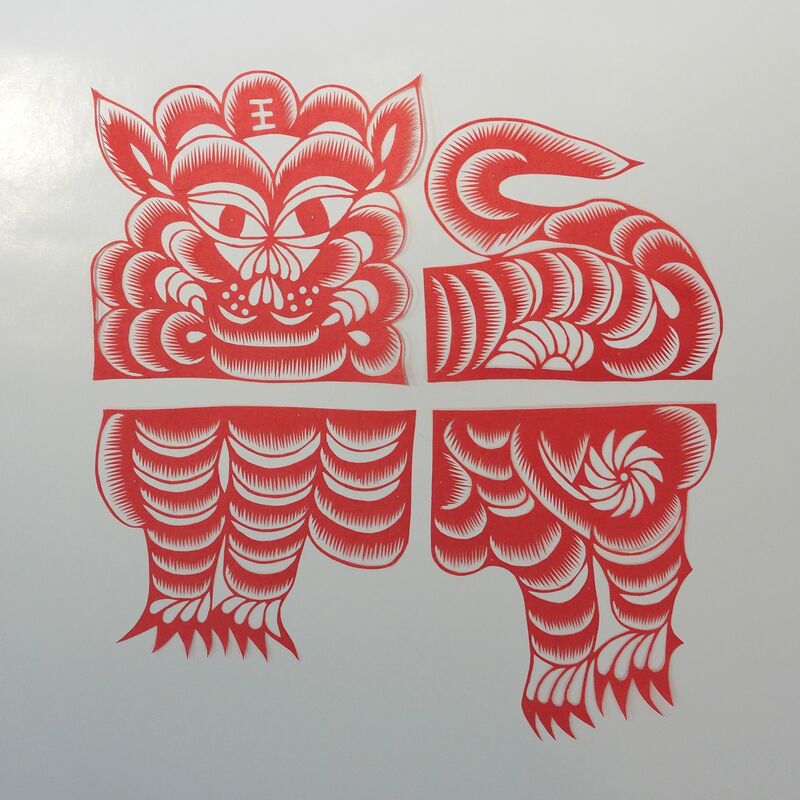 The shop will be closed during the festival and reopen again on 4th February (Tue) Chinese New Year day 5. May we wish you a joyful X’mas! Click here to see our other toys. Perfect for beating egg white, melting of chocolate or just as a fruit bowl. 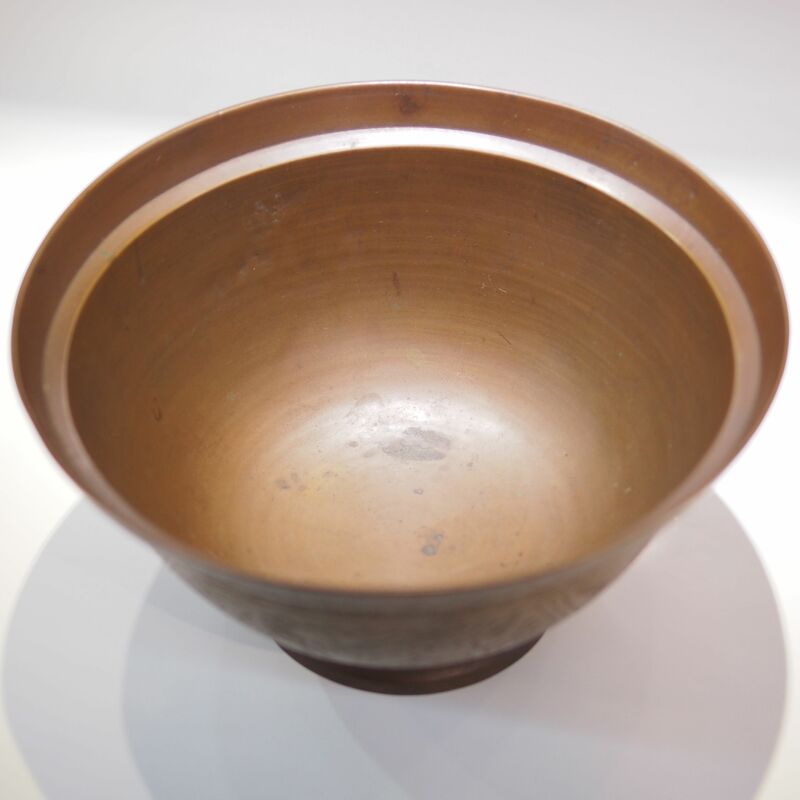 In the old days this bronze bowl would have been uses to provide offering in a Chinese temple. 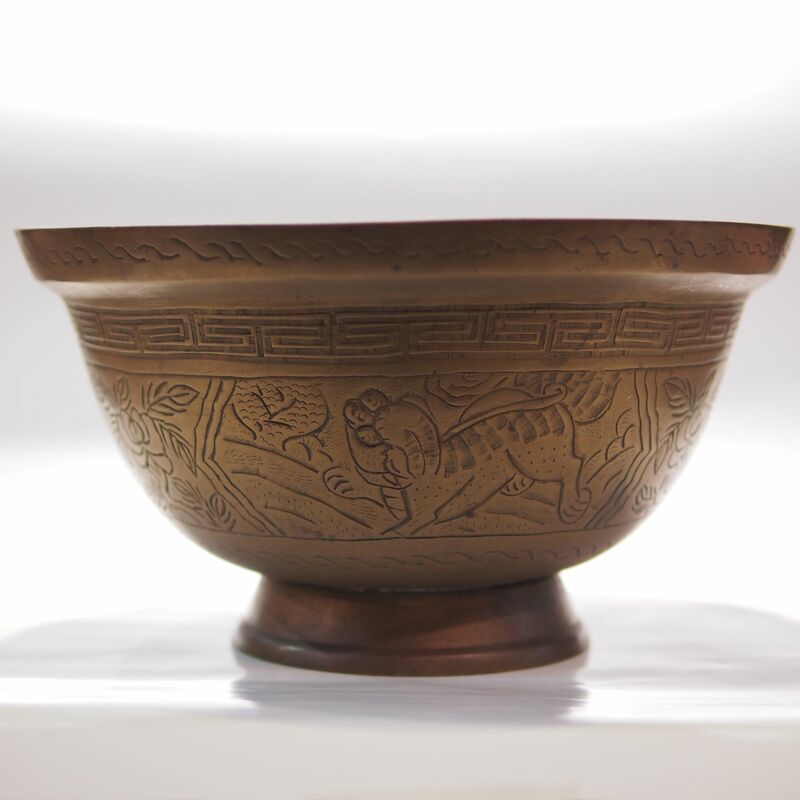 See our other offering containers; offering bowl, eight trigram bowl, bronze plate, lacquer dish. 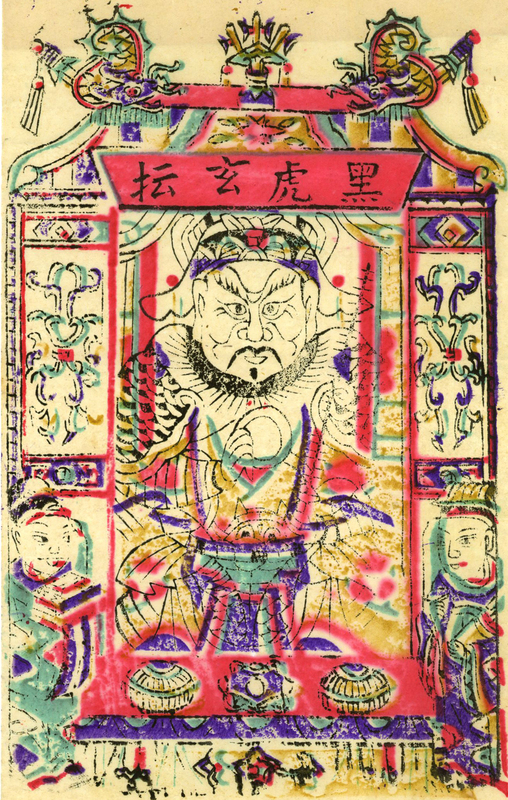 A new year wood block print of the God of Wealth, Zhou Gong Ming. It is believed that Zhou was born in humble family in the Qing dynasty. As a young he worked as a labourer for a wood merchant, being honest, generous and hard working he was popular. Soon he was able to start his own wood business and accumulated a good deal of wealth. Zhou would lend money to those who need them; one merchant borrowed some money and made a lost at a natural disaster, Zhou only asked him to return a pair of chopstick for the money owned. At time of war, Zhou used his own money to fund an army in support of his country and headed the army himself. He bravery was well known and even tamed a troubled tiger as a pet. In most of the God of wealth icon, this black tiger is at his company, here you can see it half hidden inside his coat. Because of his generosity and bravery he was worshipped after his death and named the God of Wealth. Click here to see our other items of the God of Wealth and the mystical version of his life. This special paper cutout is made for traditional window lattice; to be able to fit into the small lattice frame the paper cutout are normally of a small size. To make a bigger pattern, this tiger has been divided into 4 pieces to be paste onto the four interior corner the lattice frame to combine into a tiger. These paper decorations are called chuang hua (window flower), they are removed and paste a fresh on every Chinese New Year as a projecting of hope and blessing for the year ahead. In China, the idea of tiger is not seen as a threat but a sign of protection. The strength and bravery of a tiger is aspired to; for the Chinese New Year, parents would dress the baby up in tiger gear, both as a protection blessing as well as a wish for their son to have the tiger’s attributes. Apart from tiger mitten, there are tiger hats, tiger shoes, tiger du dou and of course tiger toys. 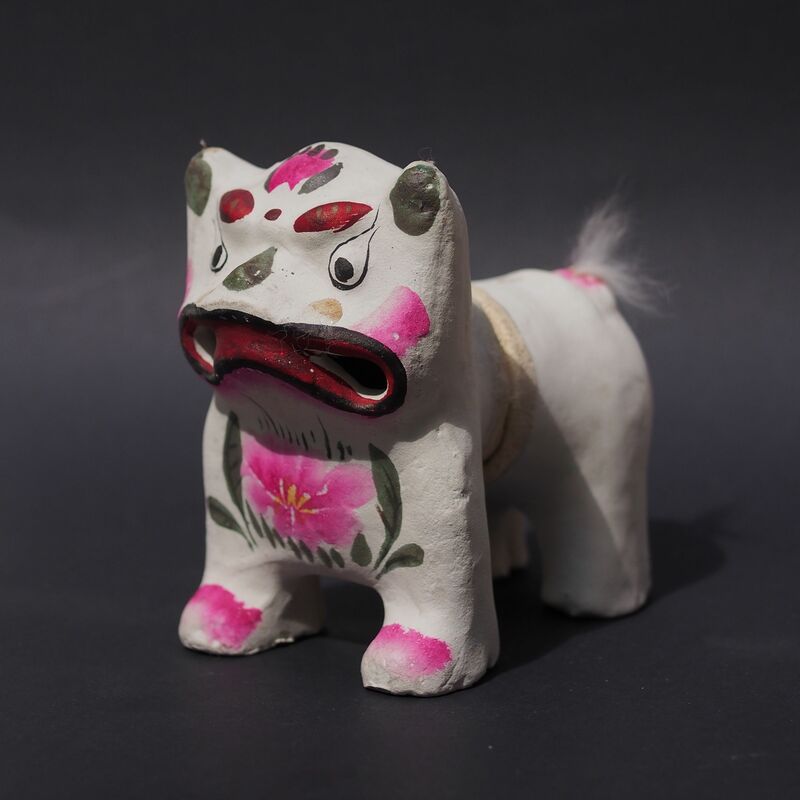 As the clay toys of Nie Jia Zhuang was selected as the Chinese Intangible Cultural Heritage, it also signified that it is a dyeing art which is in need of protection. 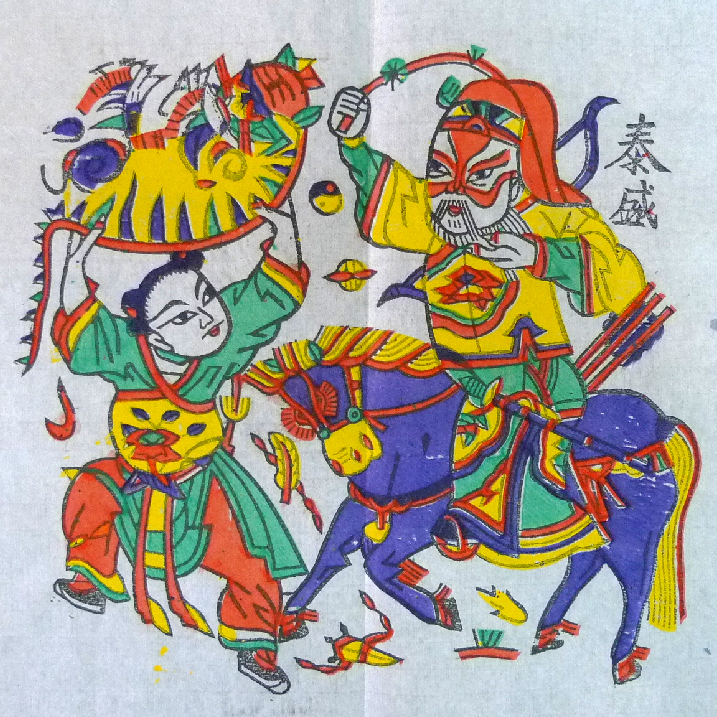 The making of clay toys in the area dated back to the Ming dynasty, folk song was sung about these colour clay toys. Up to the 80s, they were ever so popular, every kid would own one. 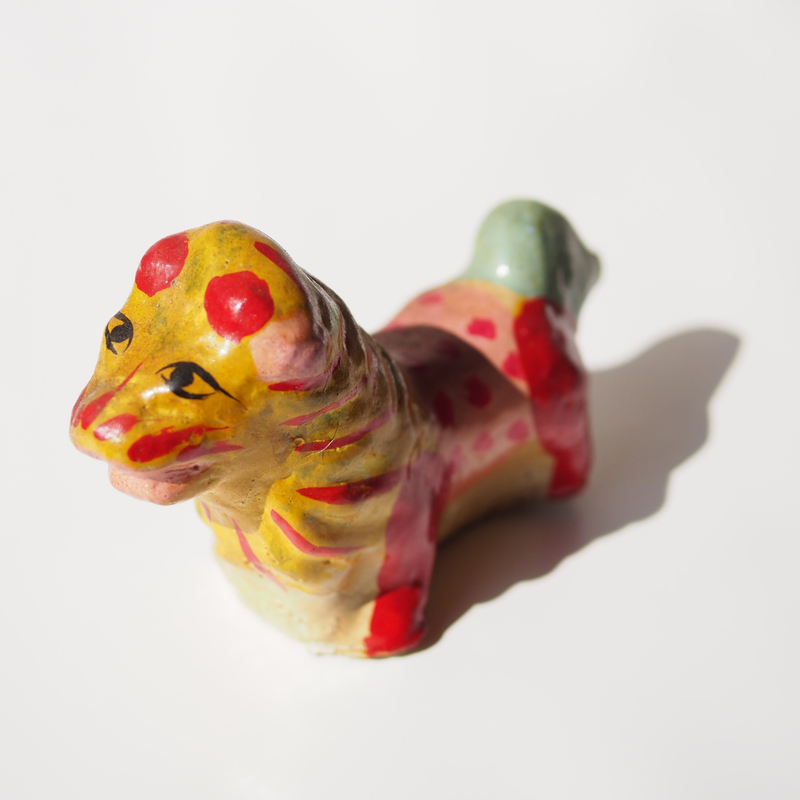 This roaring tiger, has a leather waist which forms as a bellow to the squeak inside the front half of the body. 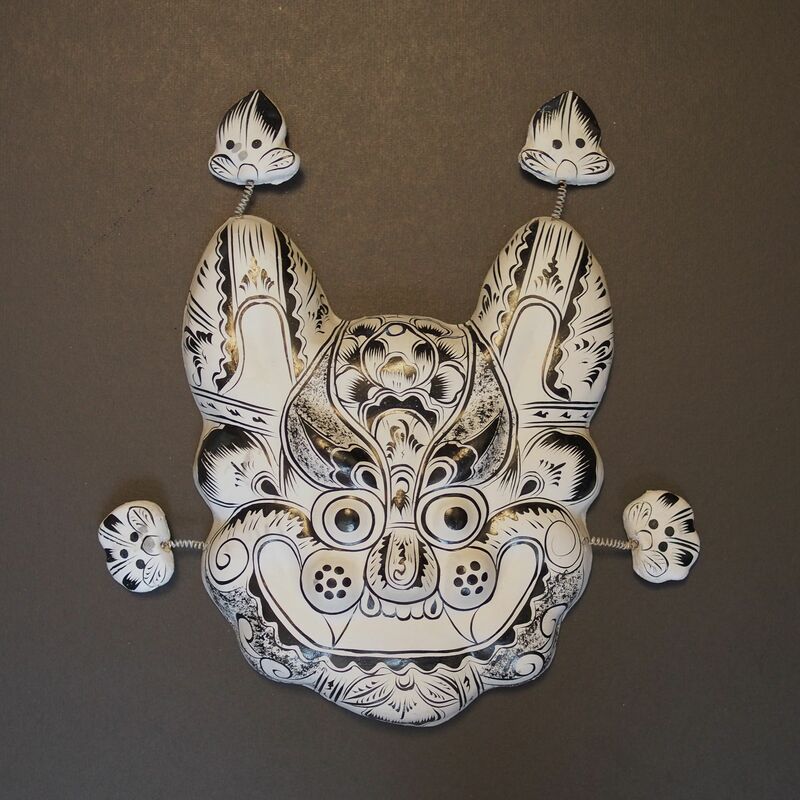 This clay wall hanger is the form of a tiger, it offers protection from the evils. In the rural area of Shaan Xi, before Chinese New Year every household would would be placed a new tiger hanger on the lintel of the door. 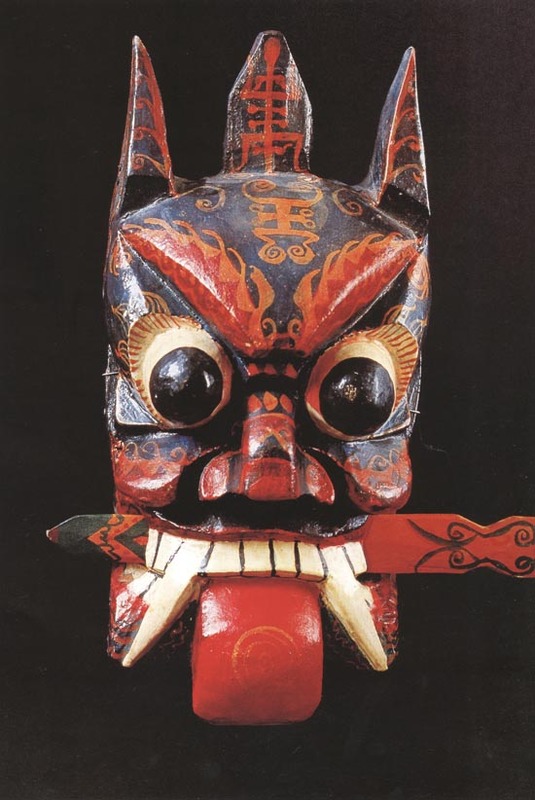 The origin of the wall hanger came from the Ground Theatre (Di Xi), find any similarity?